Read on how I made them! First make the base. Take your food processor & place S-blade in. Add whole almonds, chopped pitted dates, vanilla extract & coconut oil. Place fitted lid on & pulse, aka mix until fully joined. Stop & check if the base would stick together well. Test with your fingers. Now, smear the base & sides of the 4 tartlet cake pans in with that same coconut oil, to prevent sticking later on. With your hands, push the raw dough onto the base & into the sides all the way up. Then, with the side palm of your hand, you push the base even into the tartlet.You do this to end up with an equal lined base. With a rolling-pin, roll it over the edges, top surfaces of the tartlets. This way, the top surfaces are all equally. Place them into the freezer for about 30 minutes to firm up. Now, make the filling. This is a tasty gingered rhubarb compote. Take cooking pot & add rhubarb, coconut sugar, water & ginger. Turn heat up on medium heat, stirring often. Boil until you end up with a lovely compote aka rhubarb caramel & your rhubarb is soft. Check with a fork. When compote is completely cold, spoon it out on top of the 4 tart bases. Using a hand palet knife, level the compote even out into the base of the tartlet. Place onto a clean plate & place into the freezer for 30 minutes to firm up & get really cold. The final thing is to make the topping. This is the cashew caramel. Take your Vitamix & add soaked cashews, pink salt & start with 3 tablespoons maple syrup. Place fitted lid on & tamper & blend onto high-speed to. Use tamper to push ingredients into the running blades. taste. I added 3 tablespoons of maple syrup extra so that is 6 tablespoons of maple syrup in total. It is super yummy too! Take tartlets out of the freezer & spoon your cashew caramel evenly on top of each rhubarb filling. Level it all smoothly out with help of a hand palet knife. Place all 4 of them into the freezer for about 1 hour to harden the caramel a bit. Take them out of the freezer & place into the fridge. Just prior, 10 minutes before devouring them, take them out of the fridge. 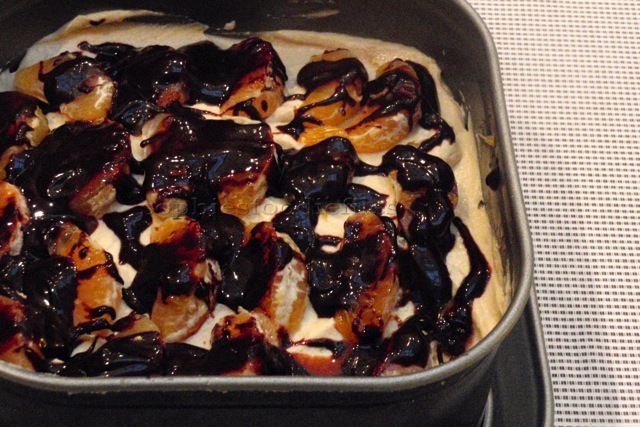 this way, the caramel top will melt a bit & will get all goewie & that is what you want, right? Carefully, take the tartlets out of their casings, without losing the tart sides, of course! Then, with help of a knife, remove the tartlet base too. Enjoy with a good cup of coffee or with an nice lovely tea & with a loved one too! 🙂 MMM! ♥ Stay Tuned & subscribe by email! Join 1,800 email subscribers now!!! It is free!!!! Click the link here below to subscribe!!! 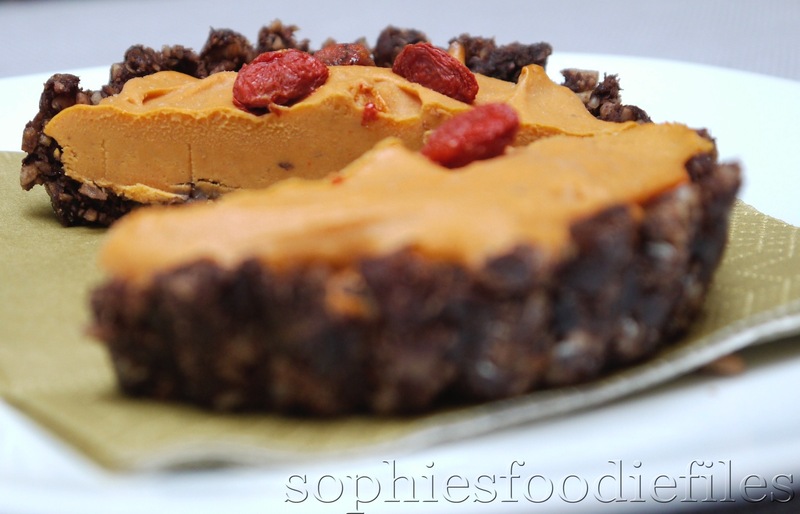 Raw Vegan Gluten-free Goji berry brownie tartlets! Reblog! Yesterday evening, I invented these tasty beauties! Check them all out! 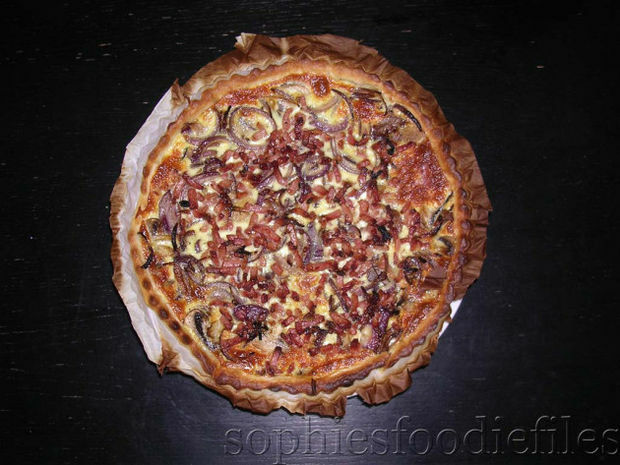 Recipe: For 5 x 7 cm tartlets! * To top your desserts with before going into the freezer: 4 dried goji berries to top each tartlet, so 20 dried goji berries. 1. For the base, take your beloved food processor & place the S-blade in. Add hazelnuts & pulse a few times until crumbled into smaller pieces or until to your liking. Now, add pitted dates, raw cacao powder & 1 tablespoon of water. Pulse to combine. Check the base with your hands. It has to stick together when pressed into a ball. If not, add a bit more water, but my raw brownie base was just right! 2. Take 5 smaller tartlet tins with removable bottom. 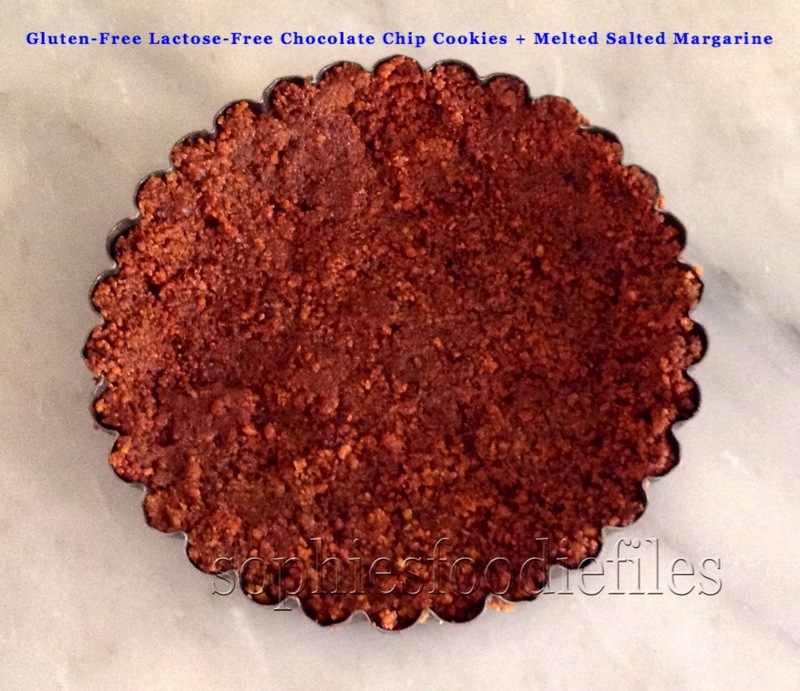 With your hands, push brownie base into the bottom & all the sides up of your tartlet tin. See that all the sides upside & down are filled with brownie material. With the help of your finger, push the dough into the base bottom & push it down with your finger or thumb. Push it down so that the base line is about equally flat. It is a sticky business. If this is all done, place into the fridge while you make the filling. 3. Take your Vitamix & add cashews, dates, goji berries & vanilla extract. Also use the tamper to push the ingredients into the running blades. Stop & taste. It will be a bit more sweet but just so yummy! It will be dark orange in color! 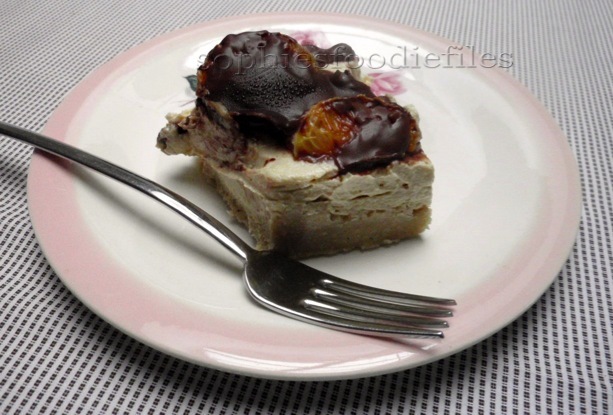 Spoon your filling into the 5 raw brownie tartlets, all evenly divided. The rest you lick of your spoon & Vitamix! Ha! Now, top each tartlet with 4 dried goji berries, just the way you like it. Carefully place them into the freezer for 1 night or for at least 4 hours. 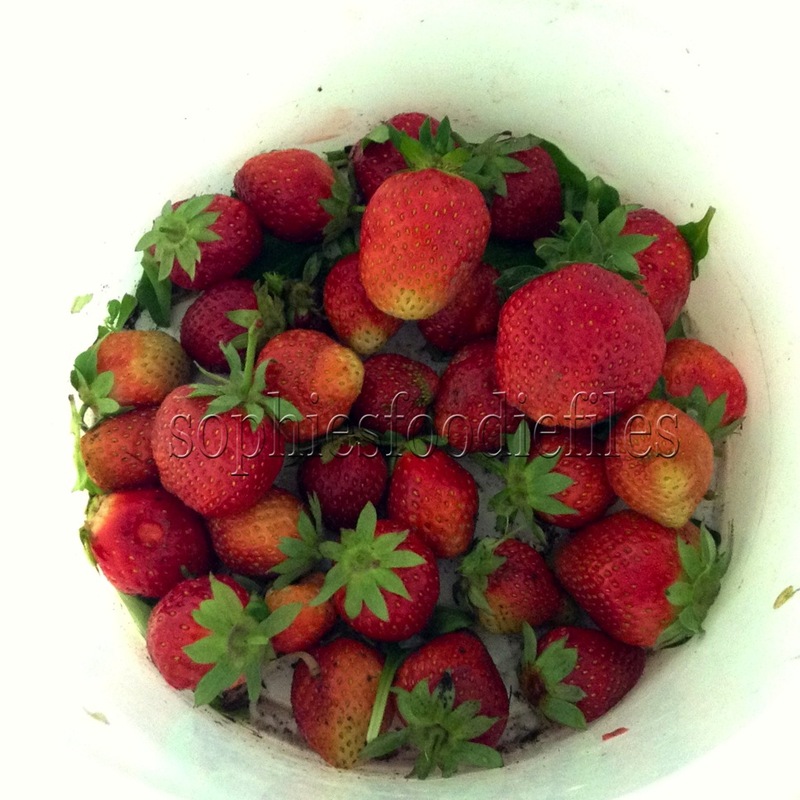 Take them out of the freezer 30-45 minutes before eating. 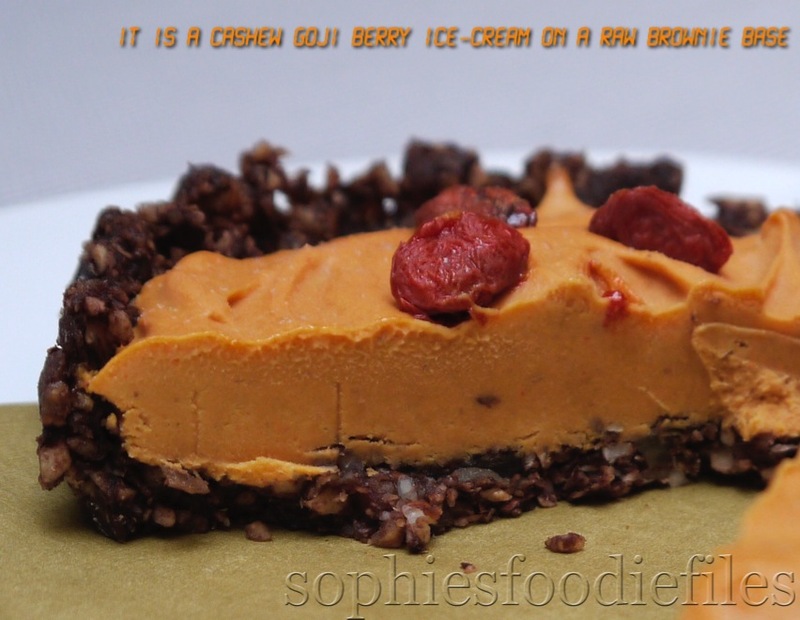 The top is like a beautiful soft creamy cashew goji berry ice-cream & the base is a raw brownie in a tartlet tin! Wait 15 minutes before removing the tin outside & the bottom. Yummm! They are Raw, Vegan, Gluten-free, corn-free, soy-free, egg-free, healthy & very filling too with all of these nuts in them! Before they went in the freezer you tasted the dates a lot & after 1 night in the freezer you taste the goji berries better! 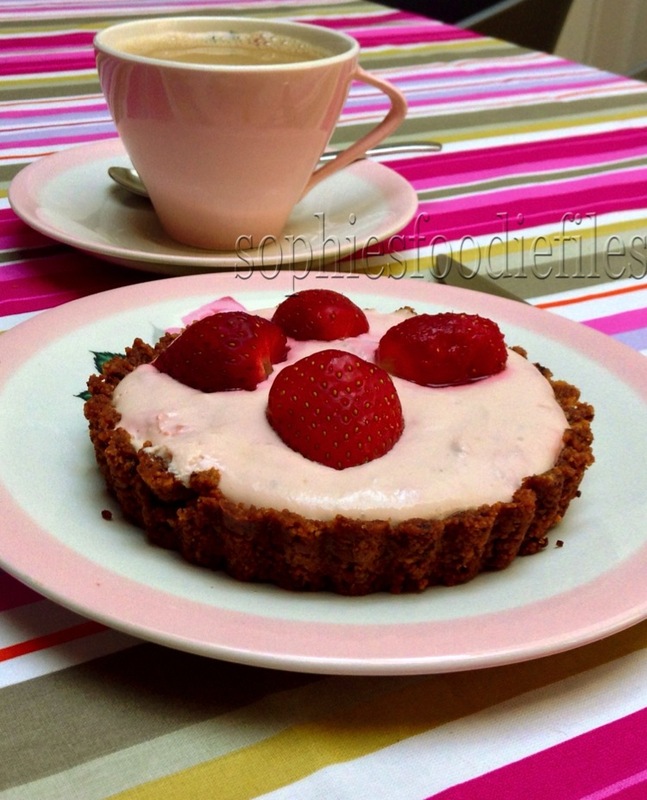 No-bake Vegan Gluten-free strawberry cheesecake tartlets topped with cashew caramel! 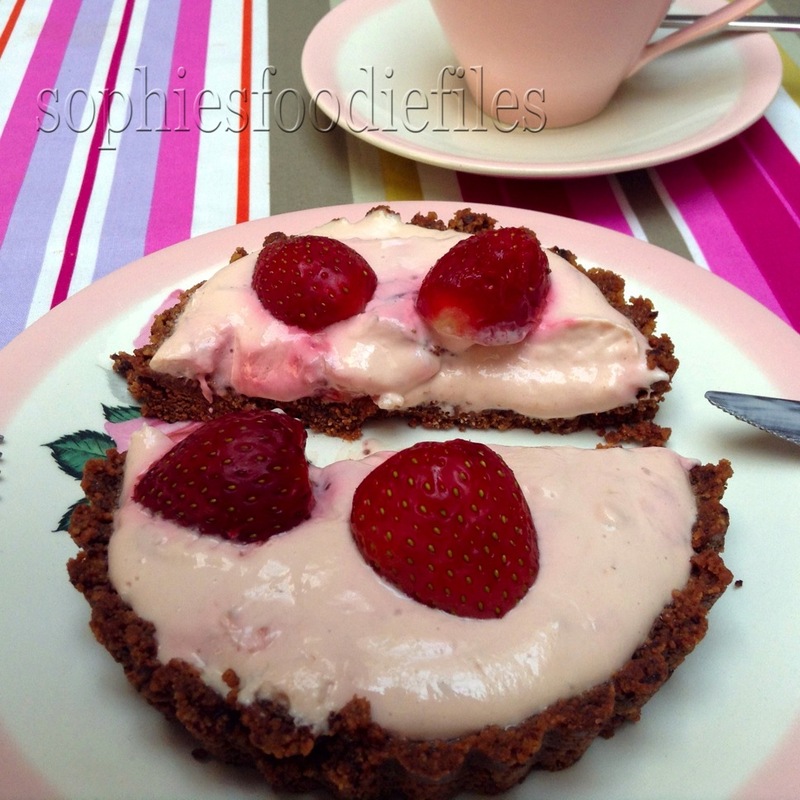 No-bake gluten-free Lactose-free strawberry tartlets! Raw vegan gluten-free goji berry banana smoothy! 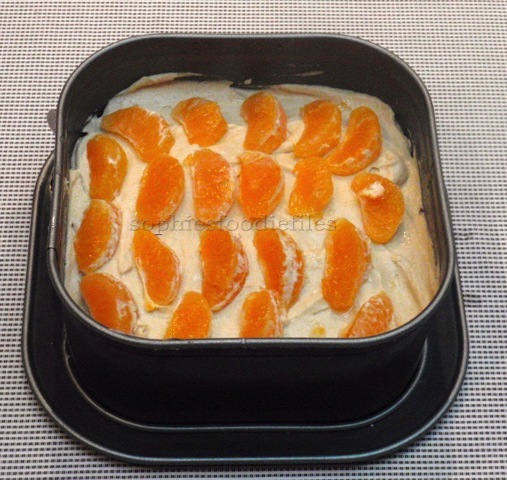 Today, I invented this lovely No-Bake clementine cheesecake. It happens also to be Vegan! 😉 No cashews in here! It was a creation of hard work & lots of love,…hahahhahaha! This no-bake vegan cheesecake itself is very creamy, delicious, has no cashews in it & is super addictive too. MMM! Can I serve you a yummy piece? The chocolate sauce is ready! Yumm! Light & perfect in the mouth! 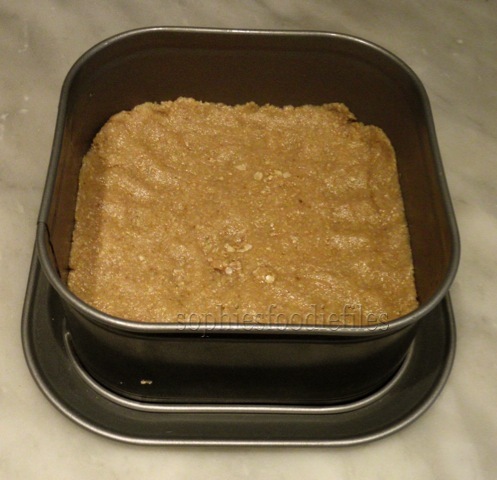 1/2 cup (72 gr) salted lactose-free gluten-free margarine, melted, measured before melting!!!! 1. First, make your cookie base. Take your beloved food processor & place S-blade in. Put broken chocolate chip cookies in it. Place fitted lid on & pulse until it looks like finer breadcrumbs. I pulsed it a few times! No, pour melted margarine to it, place lid back on & pulse until it all comes together. This will only take a few seconds. 1. 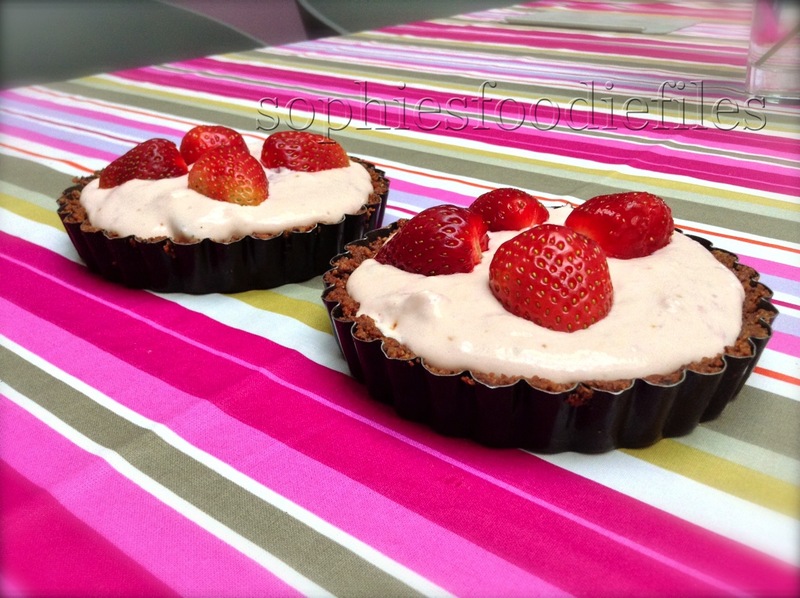 No-Bake Strawberry cheesecake tartlets topped with a cashew caramel! 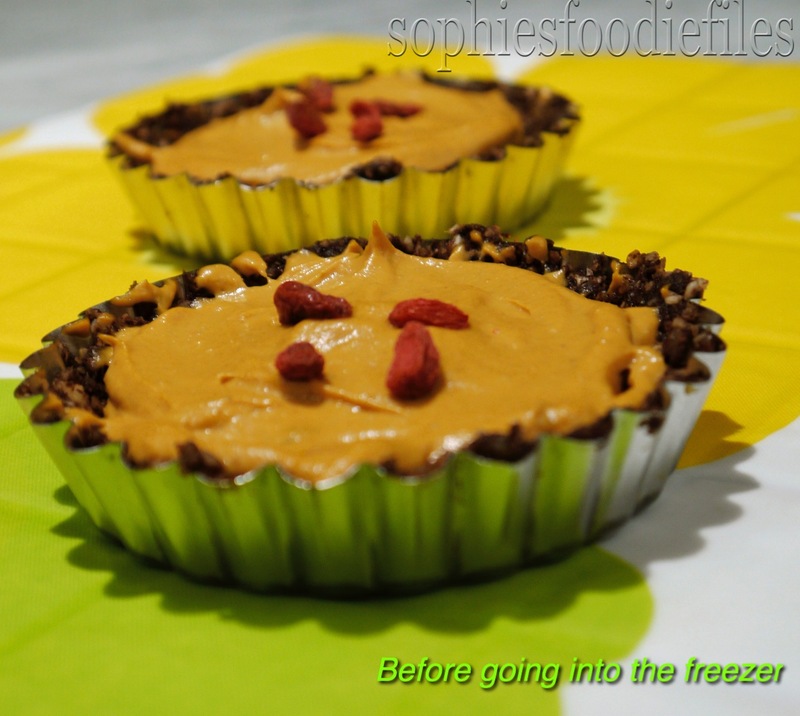 Raw Goji berry brownie tartlets! This morning, I made my first invented pecan pie! 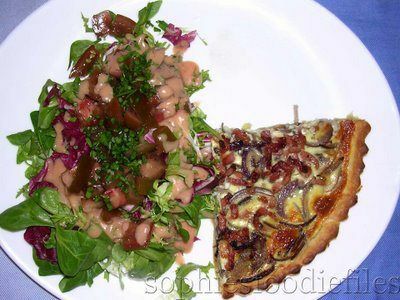 I saw many unhealthy recipes on the internet & on other blogs so I tried to make it much healthier & I think I succeeded! The only not so healthy ingredient in here is vegan butter! 😉 This is a pure sweeter indulgent of a fine dessert, something new in flavors for Peter & me! I didn’t make it too sweet. I don’t like my tarts to be too sweet. Instead of corn syrup I used maple syrup, grade C! The next time, I will make it into a tartlet tin with loose bottom, much easier in getting the pie aka tart out of the pan! 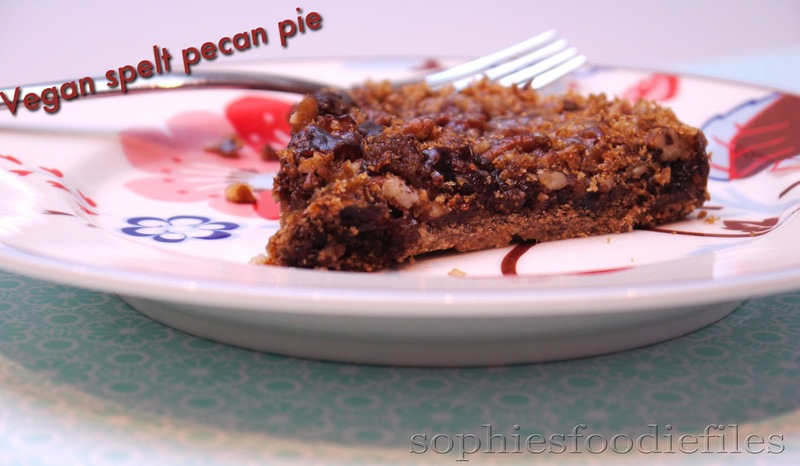 Make this fantastic delicious vegan spelt pecan pie right now! Recipe: For 1 medium pecan pie! 1 cup vegan butter ( 130 gr ) , you will melt it & use 1/2 of it. 1. Make your pie base & preheat your oven to 180° C ( 350 F ) for 10 minutes. In a medium bowl, add whole-wheat spelt flour & coconut sugar. Mix with a spoon. Melt your vegan butter on low-heat. Pour 1/2 of the melted vegan butter to the flour-coconut sugar mix. 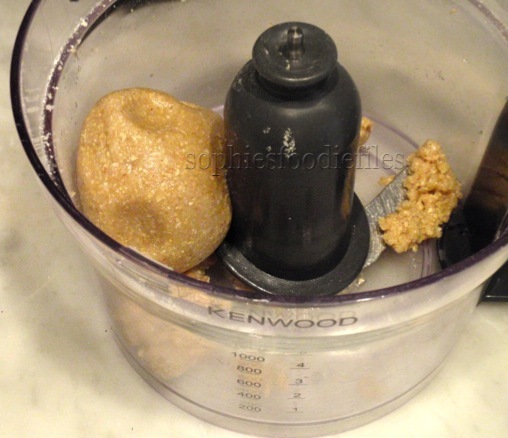 Mix with a wooden spoon until it resembles crumbles that stick together. With a wooden spoon or with your hands, mingle it together. Use a pie pan & smear it in with vegan butter, also on the sides! Push your base into the pie plate. Push it until it forms an equal thick base. Push with your fingers into right into the corners. You mustn’t see any spaces open. Bake into the lower shelf of the oven for about 12-15 minutes. Take out of the oven & set aside. Close the oven door. 2. Make your pecan pie topping. On a chopping board, chop your pecans finely & add to a bowl. Also add sherry vanilla extract, the other part of the melted vegan butter, maple syrup, coconut sugar, apple sauce, pink salt & finally, the solid coconut oil. Mix well with a wooden spoon & taste! It tastes heavenly & the salt in here takes it all to a whole other level of flavor! 😉 MMM,…Pour this batter over the base top & spread it evenly all over the pie base. This means also the cut up pecans. Bake in the lower end of the oven for about 22-25 minutes until the edges are browned & nearly set & there is a lovely caramel over the pecans! 3. Carefully, take out of the oven & place on a wire rack to cool down completely. When cold, with the help of a knife, go around the edges of your pie pan & loosen the base sides with a knife. Cut your pecan pie into serving sizes, not too big because it is a rich dessert! Enjoy with a;loved one! My husband Peter gave it a 10/10!!! A new family favorite! Do store cool but not in the fridge! 🙂 ♥ Stay Tuned & subscribe by email! Join 1,800 email subscribers now!!! It is free!!!! Click the link here below to subscribe!!! Get my free E-book: Healthy Vegan christmas too!